During the past few years, investor interest in Bitcoin and the cryptocurrency markets has exploded, with the overall market capitalization of the more than 1,500 cryptocurrencies currently in circulation approaching $500 bln. More recently, the number of hedge funds focused on cryptocurrency investments has surged, while the CBOE and CME launched the first ever Bitcoin futures in 2017. Despite the growth in both retail and institutional interest in the cryptocurrencies, the number of firms producing institutional quality research of this new asset class has clearly lagged. The following article reviews sources of cryptocurrency research in addition to firms we identified (subscription required) early last year. Institutional interest in the cryptocurrency market really didn’t take off until 2017, when 57% (or 99) of all new funds focused on this asset class were launched – marking a 660% surge in new crypto fund openings. According to Autonomous NEXT, the number of crypto hedge funds is currently 175, totaling $3.0 bln to $4.0 bln in AUM. 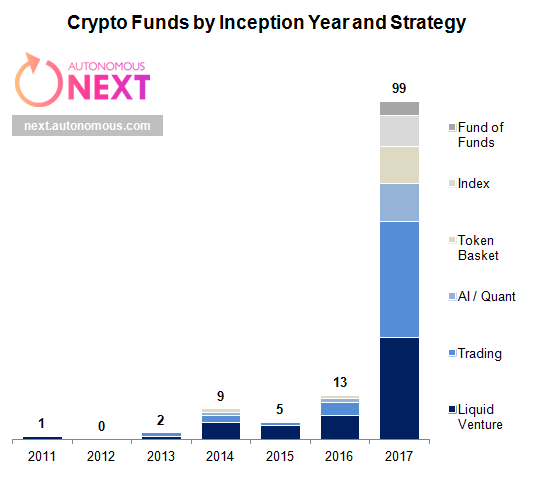 Based on Autonomous NEXT’s analysis, crypto funds can be categorized into the following strategies: (1) liquid venture investing in tokens, (2) cryptocurrency traders and former hedge fund managers, (3) artificially intelligent or automated bot funds, (4) funds of funds in a fairly traditional approach, (5) token baskets, usually raising money through their own tokens to invest in other crypto assets, and (6) passive crypto-indexes. As you can see from the above chart, cryptocurrency traders / former hedge fund managers and liquid venture investing are the two fund types with the most players. 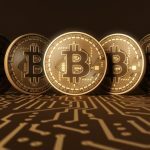 One factor which has prompted this rise in institutional interest in the cryptocurrency market has been a desire by fund managers to capture some of the stellar gains seen in these assets in recent years. Bitcoin, the granddaddy of all cryptocurrencies, rose over 1500% against the dollar in 2017. Hedge fund industry data provider HFR recently launched the HFR Cryptocurrency Index, meant to track investment in the space. The HFR Cryptocurrency Index has posted annualized performance of 381% over the past three years, and has surged 2,511% over the past twelve months. The second factor that has bolstered institutional interest in cryptocurrencies has been the CME and CBOE’s introduction of Bitcoin futures. While still in their infancy, these futures contracts are seeing growing trading volumes suggesting that investors are getting more comfortable with these new instruments. Historically, adding derivatives to a spot market has been an indication of the maturity of that market, suggesting that Bitcoin (and all cryptocurrencies) are becoming more accepted as an asset class. Autonomous NEXT: Founded in 2017, Autonomous NEXT is the Fintech practice of UK-based institutionally oriented IRP Autonomous Research which focuses its thematic research on the impact of technology on the future of finance. Currently, Autonomous NEXT covers two major themes – the role of Roboadvisors and Digital Wealth Management; and the Crypto Economy and Blockchain. Autonomous NEXT offers clients of its’ crypto research a number of industry pieces, commentary, and related data. In addition, the group offers its premium clients extensive custom advisory services. Autonomous NEXT is run by FinTech entrepreneur and speaker Lex Sokolin. Weiss Cryptocurrency Ratings: Launched in late January 2018, Weiss Cryptocurrency Ratings is a subscription-based quantitatively oriented ratings service published by independent ratings agency, Weiss Ratings. This service currently rates 74 of the more than 1500 cryptocurrencies which represent over 80% of the market cap for cryptocurrencies. The Weiss model assesses the risk, reward, technology and other fundamental aspects of adoption and security associated with the cryptocurrencies it covers. This service is targeted primarily at retail investors (the service costs $468 per year). This service caused a stir in the cryptocurrency markets by giving Etherium a B rating, whereas it rated Bitcoin a C+ rating in its initial set of ratings. Standpoint Research: Founded in 2004 by former Israeli army sergeant, Ronnie Moas, Standpoint Research is a Miami Beach-based independent research firm that has been providing investment research to retail, high net worth, and institutional investors on the stock and cryptocurrency markets. Standpoint’s research is based on a 155-variable quantitative model which is combined with a subjective fundamental assessment and technical analysis overlay. Launched in July of 2017, Standpoint’s cryptocurrency research service provides monthly reports and weekly notes on the top 40 cryptocurrency names. This service is targeted primarily at retail and high net worth investors (the service costs $1,200 per year). The explosive growth of the cryptocurrency market over the past few years has prompted a large number of crypto-oriented hedge funds to set up shop during the past two years. However, the production of institutional quality cryptocurrency research has not kept up with this growth in potential demand. 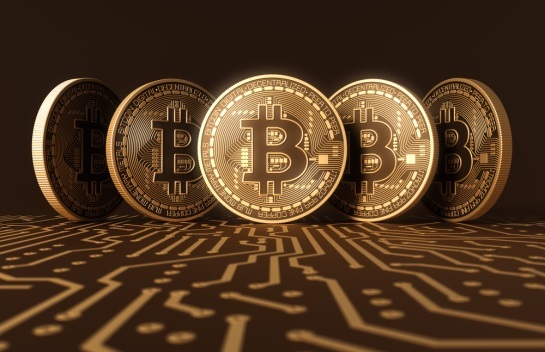 Part of this could be because the cryptocurrency markets are unlike other investment assets, making them difficult to analyze using traditional fundamental or quantitative research techniques. Others may want to avoid the risk of producing research for the cryptocurrency market as they see it to be another tulip bulb mania, ready to implode at any moment. But whatever the reason, demand will create its own supply. Consequently, we expect in the coming few years to see a growing number of existing research firms add a cryptocurrency research product to their mix. In addition, we would be extremely surprised if we also didn’t see a whole new group of research firms pop up that will marry deep cryptocurrency expertise with investment analytical skills in order to provide unique insight for institutional investors in this new asset class. Clearly, this is a research segment of research that the team at Integrity Research will keep an eye on. If you know of any research providers that are currently offering institutionally oriented investment research on the cryptocurrency markets, please contact me at michael.mayhew@integrity-research.com.